This recipe is from my book–Delicious Dishes for Diabetics– to be published in August. It is adapted from a favourite recipe of Quentin Blake, the illustrator of children’s books. It’s very simple but a bit scary because the fish is cooked at such a high temperature it doesn’t seem possible it will survive the heat, but the scales protect it. This fish looked good on the stall in Castres market on Saturday morning. It weighed in at 1.25lb–perfect for 2. M. Gayraud, the fishmonger, gutted it but left the scales on. He pulled back the head to show me the brilliant freshness of the gills. salted the cavity and stuffed it with two or three sprigs of rosemary. 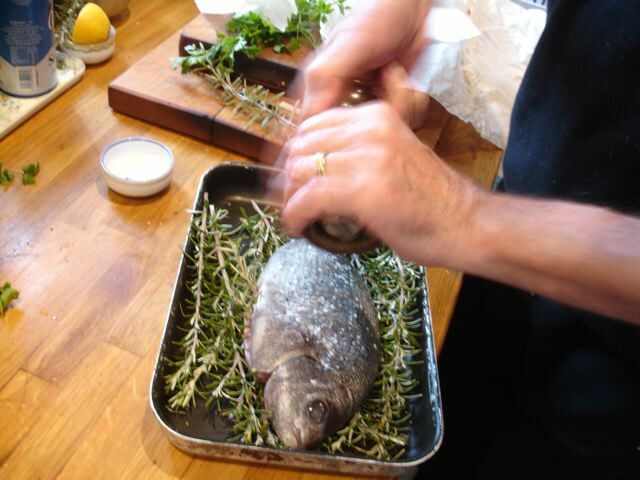 Then I laid the fish on top of the rosemary and seasoned it with salt and pepper. It went into the middle of the oven and cooked for 15 to 20 minutes, the time depends on the size of the fish. Peel back the skin a little –the flesh should be white and succulent. When you are satisfied, peel off the skin and carefully separate the fillets. Serve with this simple sauce. Put the juice in a bowl and add the seasoning. 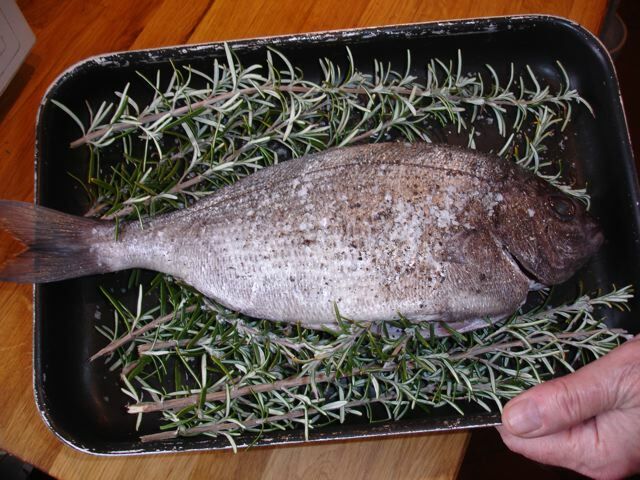 Sea bream is Daurade–in this case Daurade Grise. Hi encore Rosemary, and thanks–I didn’t at first see the rest of your post, I’m a bit new to this. The “bowl”–you were right–is there now! No broccoli now–just the nourishing cauliflower, for which there is a second recipe below the socca recette. I can see that your blog is going to be a problem, I’n not used to sitting at my computer looking at pictures of delicious food being prepared. It’s making me hungry! And it means I can make suggestions to the cook about our supper. Is it difficult to peel the skin off, and do the scales stay attached to it? No, peel it back slowly–it’s quite satisfying. No–with any luck!– en principe anyway!